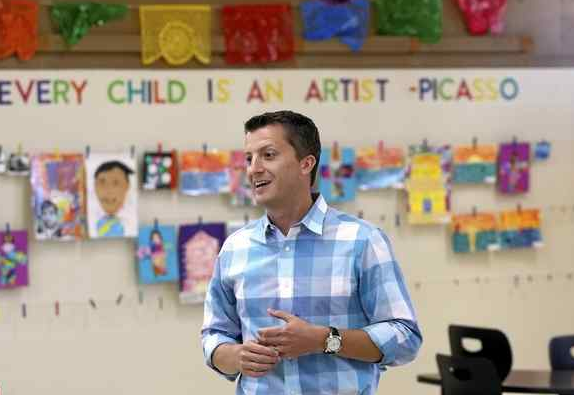 Monterey Herald…Sam Humphrey walks around the tan hallways of his new elementary school, MLK School of the Arts, and sees not just empty walls, but many possibilities. The lawn will be converted into an art garden, he said Wednesday. The walls will be used to display students paintings and photographs. And after being greeted by a mural on the front entrance, there will be no mistaking the school’s focus. It’s year two for King Elementary as a “Turnaround Arts” school, a designation that comes with a small amount of money and lots of help to boost arts education. As the new principal, Humphrey sees the designation as an opportunity to bring the subject sharper into focus.